In previous reviews, we have been impressed with the Stokke brand and the quality and innovation they have produced. So it was a little disappointing to find a Stokke stroller that did not perform well in our tests. This stroller came in 16th out of 18 strollers. The test results for the Scoot were lower than expected and it only scored above average in a few metrics. In short, the disappointing lack of features and poor performance in our tests, combined with the higher price, make the Scoot a stroller we do not recommend. Started in 1932 in Norway, the Stokke company designs furniture for children that is smart, sustainable, and encourages healthy development. The company was owned by the Stokke family for three generations showing their firm belief in family and family values. Stokke products are sold worldwide including strollers, baby carriers, high chairs, and more. The Stokke company remains committed to the environment using modern and efficient transportation to reduce emissions and their carbon footprint whenever possible. This chart lists each stroller included in the review and shows their overall scores with the Stokke Scoot in blue. The sections below contain information on the Stokke's performance during testing for each metric. The Stokke does not offer much for ease of use. The Scoot scored a 6 of 10 for ease of use, which is higher than average. The folded Stokke is rather cumbersome. The Stokke has a one-handed fold that auto-locks, self-stands, and has a carry strap. The process is anywhere between 3-5 steps depending on how you do it and it's about average for difficulty. The release is hard to work, and it doesn't work well if the seat is rear facing. Unfolding the stroller is difficult and requires 2 hands with 3-5 steps, and we fumbled with it repeatedly. The brakes on the Scoot are easy to use, even if they aren't sandal friendly. The Stokke has single action brakes that are not sandal friendly, even if they are easy to use. The openness of the storage basket on the Scoot helps it accommodate an extra large diaper bag. The Scoot has a large under seat storage basket that accommodated our extra large diaper bag during testing. It is accessible from all sides and is easy to use. The downside is it has a maximum allowable weight of 4.4 pounds, which makes it sort of useless given that most packed diaper bags weigh more than this. In addition, if you were planning on running errands that require the transport of additional goods, then the Indie isn't the product for you. This stroller does not offer additional storage. The Scoot has a medium sized sunshade with an SPF 50 rating. It offers extra ventilation by way of a zippered opening that extends the shade. This works as a peek-a-boo window but is not the traditional window with a moveable flap. The stiff harness padding makes the Stokke harness harder to adjust than the competition. The Scoot has a 5-point harness that is easy to put on and take off, but it is hard to adjust the size. Each side of the fittings pops as they go in the buckle, and spring out when released. The buckle is stiff and hard to use. The zippered opening on the Stokke canopy can act as extra ventilation or a peek-a-boo window. The Scoot does not have an adjustable leg rest, but the footrest is large and wide. It is made of plastic and is adjustable with the seat facing the rear with only one position when the seat faces forward. This limits creating a comfortable ride for all passengers. The recline on the Scoot is adjusted using strap connections on each side that have to be moved independently. This stroller offers a recline with only 3 positions and requires both hands. There are two separate side buckles that need to be unclipped and reclipped that can be frustrating to operate. The Stoke comes compatible with the Stokke PIPA by Nuna Infant Car Seat and Stokke iZi Go; not to be confused with the Nuna PIPA which is not the same and is only compatible when you purchase one of 3 accessory adapter bars. The accessory adapter multi-bar works with the Maxi-Cosi Pebble, Maxi-Cosi Pebble Plus, Maxi-Cosi Cabrio Fix, Maxi-Cosi Mico AP, Maxi-Cosi Mico Nxt, Maxi-Cosi Prezi, Nuna Pipa, Cybex Aton Q; the Chicco bar works with the Chicco Keyfit and Chicco Keyfit 30; and a Peg adaptor for the Primo Viaggio SIP 30/30. We tested the Chicco bar with the Keyfit 30. The accessory frame clicks in easily after you remove the toddler seat. The adapter frame does not require assembly and is quick to switch out. The car seat clicks onto the adapter but is sort of difficult to install. The adaptor has 2 sides and they don't line up well with the bottom of the car seat, so you have to wiggle it around a little to get it to slip down on to the adaptor. It doesn't feel stable when it is installed, but it is easy to remove and we never thought it was installed when it wasn't. This stroller is not the easiest to set up taking up almost 9 minutes total. The documentation is good with lots of information and details with useful illustrations. However, some of the competition takes less than 5 minutes and is far easier. The front wheels on the Stokke can switch between swivel and locked with easy to use levers. The Stokke earned a 4 of 10 for maneuverability; only 2 strollers came in lower. This stroller is one of the hardest to maneuver. Any adjustment, no matter how slight, requires two hands and even with two hands, it is difficult. We managed to move through tight spaces, but it is difficult to make finer adjustments. Pushing it on the carpet is also difficult with significantly slower turning. The wheels on the Scoot are foam filled rubber. This stroller did better than expected on rougher terrain, especially given its lackluster performance on hard surfaces. The Stokke is easier to store in smaller trunks if you take the seat off first. The Scoot weighs about 28 lbs, which is heavier than average. The lightest in the group is a tie between the Britax B-Agile 3 and the Baby Jogger City Mini with a weight of 17.5 pounds each. It measures 10,382 cubic inches when folded which is average for the group in volume and slightly heavier for weight. 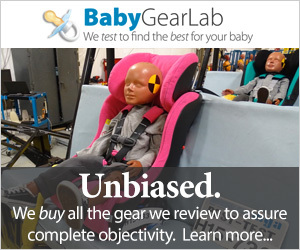 The Stokke earned an average rating for quality in our tests. The Stokke earned a 6 of 10 for quality which is above average in our tests. The high score of the group is an 8. The fabric on the Scoot seat and canopy are smooth canvas that wipes clean but feels rough. The fabric is nice looking and has a sophisticated flair that is not commonly found in baby products. The peek-a-boo window is a medium woven mesh that did not snag and the basket is rubber coated mesh that is strong and easy to clean. The frame is nicer than the fabric and it lines up well with almost no play. The wheels are foam filled rubber that combines what we love about rubber without the potential for a flat. The overall fit and finish of the Stokke are not as nice as other Stokkes we have reviewed. While the design is simple and clean, the fabric doesn't fit well on the frame. The handlebar height adjustment on the Stokke rotate on a pivot, which results in bringing parents closer to the stroller with the higher handlebar height. The handlebar has an average comfort level compared to the competition. The tubing is a nice shape and size, but the bar shape is not very ergonomic. The comfort factor for the Scoot is only about average compered to the other products in our tests. The Stokke has rear suspension that is not adjustable. The seat has nice padding, but it jiggles. The larger tires may add some comfort to the ride for the passenger but overall the comfort is about average. Amazon $549.00 - 22% off!